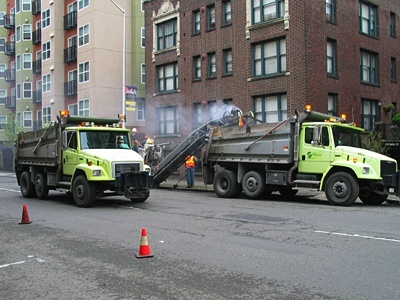 I’m lucky enough to have some repaving work going on right outside my apartment this week. That means that not only can I not park in out front to load or unload things from the car, but I get assaulted with horrible fumes from whatever it is they’re doing. I’m not sure if they are melting down the old asphalt or what. I expect bad smells from putting down asphalt, but I was surprised to experience smoke and fumes while they pull up the old surface. At least it won’t last for long. They claim it’s only going to be happening this week.